Recently a couple of people have asked me about the Newton – Raphson method for finding roots of equations, and why it works, so in keeping with the festive spirit here is a brief overview of why. Incidentally, I’m working this up into a help sheet for my further maths class so any additional input would be great. A nice little numerical method if finding the root of an equation. You start with an approximation (often referred to as Xo) and then you take away the ratio of f (Xo)/f’ (Xo) to get a better approximation. You keep going until you get an approximation which is correct to a suitable degree of accuracy. But why? What is this witchcraft and why does it work?! No, it’s not witchcraft, and it’s relatively simple and based on our old favourite “right angled triangle trigonometry” see, I told you triangles were the saviours of everything…. 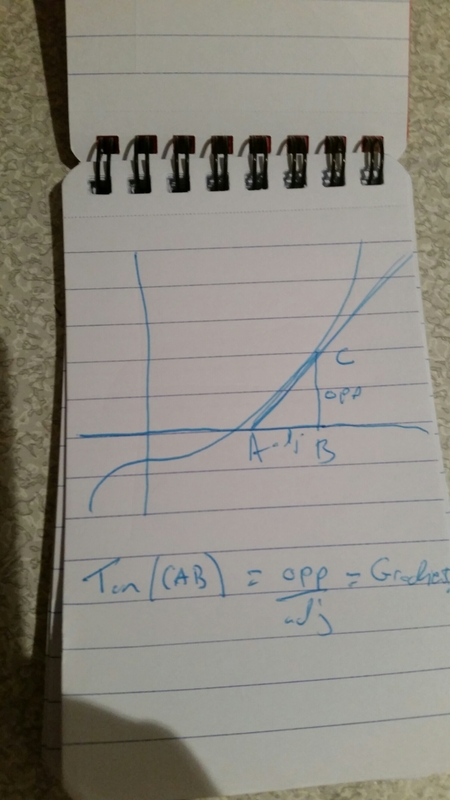 Here is a curve, as you can see I’ve drawn a tangent to it at C, a perpendicular from C to the x axis (which meets it at B) and labelled the point where the tangent intercepts the x axis as A. Already we have our right angled triangle! Now we all know that f’ (Xo) or f'(B) will give us the gradient of the tangent to the curve at that point(C in this case). The gradient of that line is the same as the tangent ratio of the angle CAB, as you can see from the sketch (as the gradient is difference in y / difference in x). The opposite side in this case is f (Xo) so the adjacent side is f (Xo) / f’ (Xo) – ie is the opposite side over the tan ratio. This shows us what’s going in here, we are taking away the adjacent side each time and getting closer to the actual root (when it does converge that is!). So, a festive look at Newton Raphson. Merry Christmas. This is the third in a series of posts which have been written for a site aimed at our A level students. The first two (fractions and indices) have led to people giving me great feedback on things I could improve and have enabled me to ensure the site, when launched, will be in great shape to help our learners. The third installment is on rounding, a topic I’ve seen really bright students get wrong and one I’ve known senior teachers to teach incorrectly. (It’s a pandemic!) Please get in touch if I’ve omitted anything, made an error, or just lack clarity anywhere. It seems ridiculous to even contemplate a help page for A level students which is based on rounding, it’s something that really should have been learned before now. Yet every year we see students who struggle to round correctly and lose daft marks through rounding errors. We hope this page will help you minimise the rounding errors and stop losing silly marks. One way people can go wrong with rounding is to round early. This can lead to an answer being far enough away from the correct answer to lose marks, even though the maths is correct all the way through. Rather than round, use the “ans” button on your calculator, or write the whole display down each time. This may still technically be rounded, but the full display should have sufficient accuracy to ensure your final answer is correct. When you are rounding at the end of a question, it is always best to write the full display on one line, then the rounded answer on the next. Before we go into rounding, I feel I should mention exact answers. This is a related area where people lose marks. The exact answer isn’t “all the digits of your calculator display”, this is still rounded. If a question asks for an exact answer it will want it in surd form, or in terms if a known irrational constant such as pi. To round to a specific number of decimal places you need to pay attention to the digit that falls one place after. If you are asked to round 4.735 to 2dp it’s the same as saying “to the nearest hundredth”. You look at the 3rd decimal place, the midpoint between 4.73 and 4.74 is 4.735, so if it’s that or higher we round up, if it’s lower we round down. You only look at the next digit. If you were asked to round 4.4444444445 to 1 dp you would round it to 4.4 as 4.4444444445 is lower than 4.45 YOU DO NOT ROUND FROM THE RIGHT. That would lead to every 4 becoming a 5 and the answer being wrong. I know it’s obvious, but I’ve known A grade A level candidates mess up here! Likewise for decimal numbers. In 0.00537 the 5 holds the highest place value, so is most significant. This would round to 0.005 to 1sf and 0.0054 to 2sf. An issue some have is when a 0 appears after a non zero digit. Ie in 0.05071, I this case we still start from the most significant, so it’s 0.05 to 1sf and 0.051 to 2sf etc. A problem some have is when it’s something like 4.745 and you’re rounding to significant figures. People get confused and round to decimal places, when actually the first significant figure falls before the decimal point. So in this case we’d get 4.7 (2sf). What should I round to? Usually exams will specify what to round to, in which case you should round to that. If it’s not specified then as long as you have used exact values then an exact answer should be fine, if you have used a rounded value then round to whatever that was rounded to. For example, if you are working with gravity in M1 you take g to equal 9.8 which is the constant rounded to two significant figures, so round your answer to that. This is the second post in a series of posts which I’m writing to appear on a website for our A level students. You can see the first one, on fractions, here. After sharing the first one I got some great feedback and have some areas to improve it, if you see anything missing from this, or feel I need to clarify / remove anything, please let me know. Indices, or index numbers. That’s those little numbers that appear raised just after a number or a letter. You know, the “2” that means squared, the “3” that means cubed, etc. They are quite often referred to as “powers”. They are sometimes written like this 3^2 means 3 squared. The power is called the index number (in this case 2) and the number being raised is the base number (in this case 3). Indices are pretty important in mathematics, and you will need to be very well versed in them to be successful on the A level maths course. But what do we do with them? We need to be able to handle indices. We will save ourselves a lot of time later if we can simplify expressions using them, and it is essential for calculus. So here are “The Rules”, but remember, they only work with the same base number (or letter)…. The first rule of indices is, you don’t talk about indices…. Sorry, I couldn’t resist. Is Fight Club even a film that people still watch? This rule is fairly intuitive. If you have 2^2 x 2^3 then you have (2 x 2) x (2 x 2 x 2) which is the same as 2 x 2 x 2 x 2 x 2, which is by definition 2^5. Try some yourself and see. This is because we are “cancelling” common factors. Taking this as a fraction we’d have a numerator of 3 x 3 x 3 and a denominator or 3 x 3, so we divide top and bottom to give 3/1 which is just 3. This rule involves raising a power to a power. Consider the problem (x^3)^2, this means x^3 multiplied by itself, which gives x^6 (using rule 1). The “shortcut” here is to notice that because of the way multiplication works, “when raising a power to a power you multiply“. A real common mistake on this type of problem occurs when you get something of the form (2y^4)^3. Often people will evaluate that as 2y^12, but that’s wrong. Don’t be one of those people. DON’T FORGET TO APPLY THE POWER OUTSIDE THE BRACKETS TO EACH AND EVERY TERM. This follows from rule 2, 3^4/3^6 gives 3^(-2) but if we cancel common factors it gives 1/3^2, hence they are the same. This one is extremely important when we get to calculus. Think of it like this, 9^(1/2) x 9^(1/2) = 9^1 (using rule 1). Well 9^1 = 9 so 9^(1/2) multiplied by itself is 9. And we know 3 multiplied by itself is 9. This follows for all square roots. By the same logic we can see that a power of 1/3 is a cube root, a power of 1/n is an nth root, etc. This is quite important for calculus. Another thing you need to be able to do with fractional roots is evaluate them, and I don’t mean just unit fractions. You need to be able to evaluate stuff like 32^(3/5). 32^(3/5) = (32^(1/5))^3 always do the root first, it makes the number easier to deal with. In this case 32^(1/5) = 2 and 2^3 = 8 so 32^(3/5) = 8. Questions like this do come up in a level papers, and they come up in the non calculator c1 paper, so it’s handy to know the first 10 powers of 2, 3 and 5. If you are struggling to remember them in an exam, you can work them out and write them down. The final note on fractional indices is that when they are involved in problems using the other rules you deal with then in the same was as any fraction problem. See this page for help in fractions. Rule 6 “Anything to the power 1 is itself” – as mentioned before. This is straightforward. 1×1=1 no matter how many times you repeat it. This is one people sometimes struggle to get their heads around. An nice way to think of it is this: 2^2/2^2 = 2^0 but 4/4=1. You can try with any base and any power, this always works. The only exception comes when the base is 0. 0^0 is undefined (or indeterminate), in the same way that dividing by zero is. Ok, so you should really be able to handle fractions by now. The fact you’re on the A level course means you’ve got a decent GCSE pass, which in turn implies a grasp of the basics, but we know that fractions can be confusing and every year we encounter A Level students who have trouble working with them. I hope you know this, but just incase, a fraction is a rational number. It can be expressed as a/b. The denominator (that’s the bottom number) tells you the number of equal parts you split 1 into to find 1 of them, and the numerator (top number) tells you how many you have. I.e. 1/4 means you split 1 into 4 equal parts and have 1 of it, so 0.25 as a decimal. And the top has to be smaller right? NO, NO, NO, NO, NO. Improper fractions are absolutely fine, in fact they are infinitely more useful than mixed numbers and I’ve no idea why you need to spend so much time changing improper fractions to mixed numbers at GCSE. Now you’re doing A Level you should avoid mixed numbers like the plague and always change them to improper fractions. Also, stop changing everything to decimals. Fractions are tge more exact form and decimals can give rise to rounding errors. Fractions are much, much better. How do I add 1 to a fraction? To add 1 to a fraction you just need to add the amount in the denominator to the numerator. To add 1 to 3/4 add 4 to the numerator to get 7/4. To add 1 to 3/2 add 2 to the numerator to get 5/2. Simples. You can multiply or divide the numerator and denominator by the same number to get an equivalent fraction. So 4/8 = 1/2 (numerator and denominator divided by 4) that’s because 4/4 is 1 so you are essentially dividing the fraction by 1. Adding fractions with the same denominator is easy, you just add the numerators. If you gave a fifth, then add another you have two fifths. (1/5 + 1/5 = 2/5). Subtraction is the inverse of addition so it works the same. The problem comes when we need to add fractions with different denominators. We do this using equivalent fractions to make two fractions with the same denominator. It’s usually best to use the lowest common denominator, this isn’t too important when using numbers, as you can easily simplify later, but when dealing with algebraic fractions it’s always better to find the lowest common denominator as otherwise you may end up with a high order polynomial. Ed: I’m going to include a diagram here, and maybe a few others throughout the post. This is often a source of confusion. And to really understand it you need to really understand what a fraction is. We know the denominator is the amount of equal parts 1 is split into, and the numerator is how many of those parts we have. Which is the same as saying a fraction is what we’d get is we split the numerator into the amount of equal parts specified in the denominator. So 3/4 is 3 divided by 4. If we imagine dividing 1 by a half, it’s the same as saying how many halves are there in 1. As we get a half by splitting 1 into 2 equal parts, the answer must be 2. Dividing and multiplying are inverse operations, and that is why dividing by 2 is the same as halving something. Multiplying by somethings reciprocal is the same as dividing by it. This works with fractions too, so if we want to divide by 3/4 we can multiply by its reciprocal (4/3). Remember, reciprocal means 1/ and the reciprocal of a fraction is found by switching the numerator and denominator around, or “flipping” it. Remember, these rules work for all fractions, whether you know the numbers or have them in algebraic form.